The villa is set on its own plot which is walled and gated with a private pool. There is also a garage which has been converted into a games room which includes a table tennis table, football game, darts and also an X Box game (plus games). The villa is in an elevated area with fantastic sea views. Being close to the town of Calpe but away from the crowds. Only 5 minutes to beaches or town by car, with 3 bars/restaurants nearby all in walking distance. Wi fi and air con in all 4 bedrooms. Bed linen and towels provided and are changed weekly. These are all included in the price. A quiet area but with the shops, supermarkets and beach just five minutes drive away. One supermarket (Consum) has home delivery of food shopping, this has to be booked when paying for shopping. Alicante airport is approx 1 hrs drive and Valencia airport is approx one and a half hours drive. We do not accept bookings from ALL female or ALL male groups - this is a family villa. En-suite bathroom to bedroom 1 with bath shower and wc. A second shower room with wc and basin Also a further toilet outside on pool terrace. Notes on accommodation: Air-conditioning in all bedrooms, warm for the winter months and cold for the summer months. A cot, high chair are available on request at no charge. WI - FI at the villa During peak times we only book Saturday to Saturday BUT if wishing to travel a day or two earlier we can highly recommend Hotel Gran Sol Calpe which is a family run hotel/bar/restaurant which is very near to the villa. Please ask for further info on this. Outside: A large private pool with a plentiful amount of terracing around the pool with sun or shade. A numerous amount of tables, chairs along with sun beds. A further kitchen/bbq area is also on the pool terrace. Cleaning / Towels / Linen / Maid service: Towels provided but please bring own beach towels. Towels and linen changed weekly at no extra charge. Other: The garage has been converted into a games room which hosts a full size table tennis table, standing football game and darts. There is also an X Box game with a selection of games. There is also an outside covered cooking BBQ area. Had a great time here, it was as described if not better. Fantastic views over Calpe. Spotlessly clean. No hidden extras to pay for which was good as everything was in the price. Was great having a restaurant / bar just round the corner to walk to, so we could have a drink. Food there was excellent and comes highly recommended. Lovely quiet location but not too far from beach etc. With bar/restaurants nearby no need to drive so everyone could have a drink. 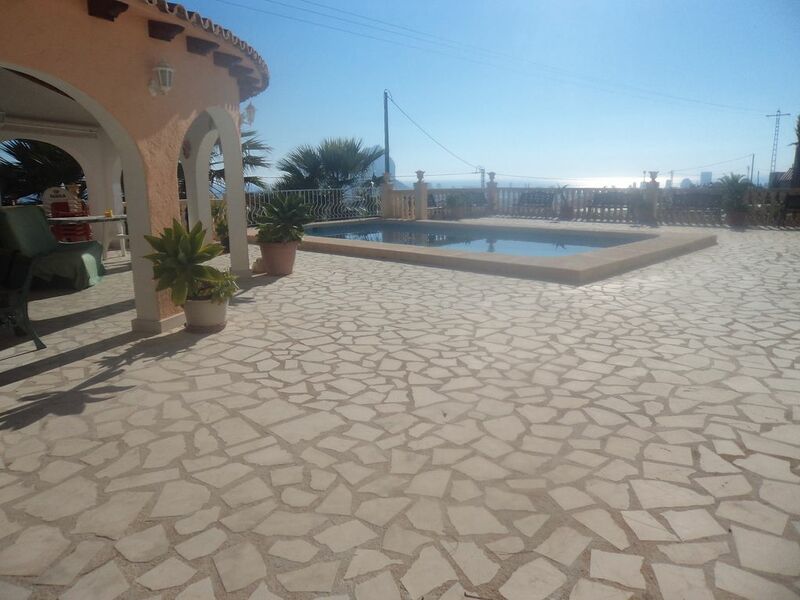 A lovely Villa with a nice size pool and a magnificent view of Calpe. We had a great relaxing holiday in the peace and quiet of the residential area the villa is situated. It took us 40 mins to walk to the town centre and I couldn't find supermarkets any closer. So I would advise a hire car for all or some of the holiday. We hired it from Victoria Cars (Fiat 5 door Panda) which was £35 per day (£25 if you book a week plus in advance!) The villa was a great base where we spent most of the week (apart from trips to the beach or Aqualandia water park) and i shall miss it. My kids loved the games room (table tennis/table football) and pool. There are DVDs, games and English TV plus we made use of the bbq a few nights. within walking distance of the villa. A beautiful villa with stunning views! 7 of us stayed here for 7 days, 4 adults and 3 children and we were all happy with the location and layout of the villa. We walked into Calpe town 3 times as it was down hill taking us 30-40 mins and always managed to grab a cab back when needed. Local restaurants were as described and very friendly, plenty to choose from, Gran Sol being our favourite! Hi glad you all had a great time and look forward to seeing you all again sometime in the future. Lovely character Villa with all home comforts and plenty of outdoor space for entertaining and eating etc. There are also good restaurants and bars within walking distance. Hosts close at hand if you need any assistance. Glad to see you all had a lovely time and enjoyed yourselves. We do our best to keep the villa up to standard and look forward to seeing you in the future. With fantastic sea views the beaches of Calpe are only a 5 minute drive away. All beaches being of top standards. There are 4 local bars/restaurants all within walking distance of the villa - 2 of which have entertainment in the evenings during the main summer season. Alicante airport is approximately 1 hrs drive. Valencia airport is approximately 1 and a half hrs drive. Murcia approximately 2 hrs drive.